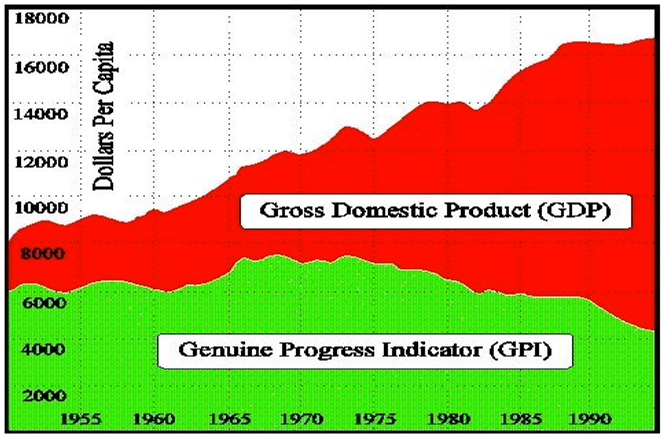 Redefining Progress created the Genuine Progress Indicator (GPI) in 1995 as an alternative to the gross domestic product (GDP). 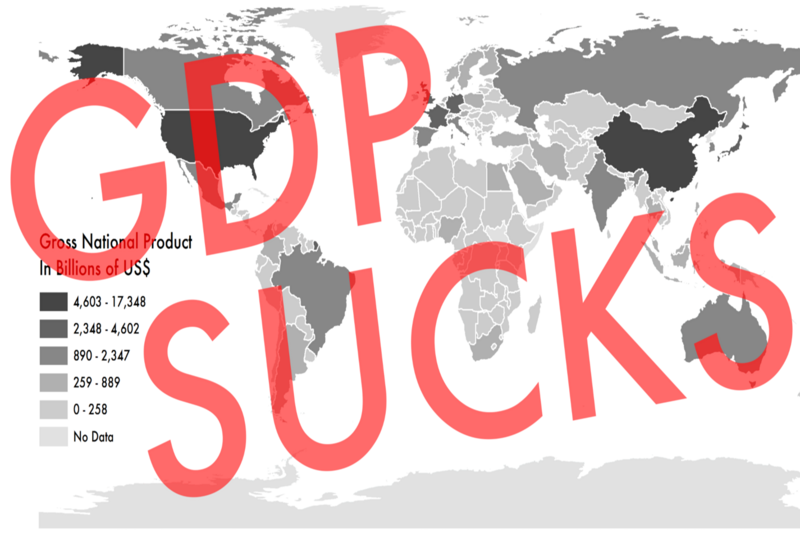 TPB Observation (in 2016) ... Why is it that GDP is still one of the dominant metrics in modern economics? The fundamental flaws in GDP as a meaningful measure for economic performance were recognised many decades ago. Kuznets who developed the measure in the United States and Keynes understood the limitations before the Second World War! Kuznets and Robert Kennedy both spoke out about the flaws in the GDP metric in the 1960s. So why did nothing get changed. My experience as a corporate CFO may be helpful. It was so much easier to increase profts for stockholders in an environment of economic growth ... that is GDP growth ... than in one where the economy was stagnant ... that is no growth! In the late 1960s there was a lot of growth, but in the early 1970s the bubble burst and then worse, the OPEC oil shock that resulted in massive increase in energy costs for US companies that had become incredibly sloppy with their use of really cheap energy. Many companies got into serious financial difficulties and the Nixon / Ford / Carter series of administations in Washington were unable to make much difference. It is my view that corporate thought leaders have had a big role in promulgating the myth that economic growth is essential for profit growth. This has been copied by economists and political leaders who then conflate GDP growth with the potential for job growth. The GPI is used in ecological economics, 'green' economics, sustainability and more inclusive types of economics. It factors in environmental and carbon footprints that businesses produce or eliminate, including in the forms of resource depletion, pollution and long-term environmental damage. GDP is increased twice when pollution is created, since it increases once upon creation (as a side-effect of some valuable process) and again when the pollution is cleaned up; in contrast, GPI counts the initial pollution as a loss rather than a gain, generally equal to the amount it will cost to clean up later plus the cost of any negative impact the pollution will have in the mean time. While quantifying costs and benefits of these environmental and social externalities is a difficult task, 'Earthster-type databases could bring more precision and currency to GPI's metrics.' It has been noted that such data may also be embraced by those who attempt to 'internalize externalities' by making companies pay the costs of the pollution they create (rather than having the government or society at large bear those costs) 'by taxing their goods proportionally to their negative ecological and social impacts'. GPI is an attempt to measure whether the environmental impact and social costs of economic production and consumption in a country are negative or positive factors in overall health and well-being. By accounting for the costs borne by the society as a whole to repair or control pollution and poverty, GPI balances GDP spending against external costs. GPI advocates claim that it can more reliably measure economic progress, as it distinguishes between the overall 'shift in the 'value basis' of a product, adding its ecological impacts into the equation'.:Ch. 10.3 Comparatively speaking, the relationship between GDP and GPI is analogous to the relationship between the gross profit of a company and the net profit; the net profit is the gross profit minus the costs incurred, while the GPI is the GDP (value of all goods and services produced) minus the environmental and social costs. Accordingly, the GPI will be zero if the financial costs of poverty and pollution equal the financial gains in production of goods and services, all other factors being constant.